Northern Cali presented us with an ideal testing ground for the 2019 RAV4. 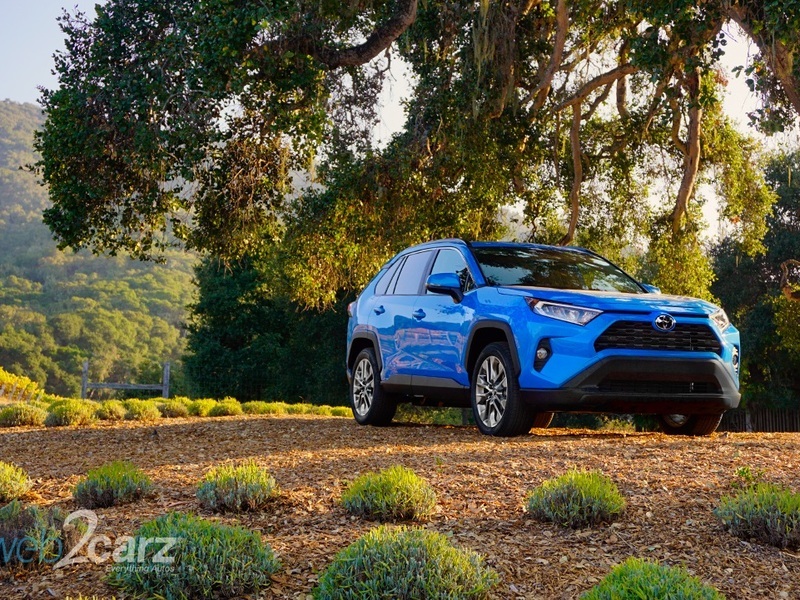 Last week, we ventured out west to picturesque Carmel in Northern California to get the inside scoop on the all-new 2019 Toyota RAV4. Fresh off a redesign, we couldn’t wait to drive this 5th generation compact SUV on a variety of highways and terrains. The Toyota team brought along a healthy mix of grades for us to try and we wasted no time seeing how they compare. To get the full picture of the 2019 RAV4's capability, we took them out on curvy oceanside highways and a rocky, off-road course with a sizable hill climb and decent. The Adventure grade was our pick for a drive along the Pacific Coast highway. As we explored the local sights of the oceanside towns in the gas Limited and Adventure grades plus the XLE Hybrid, we found the 2019 RAV4s to be a capable and sporty sidekicks to our West Coast adventure. Is the new RAV4 worth a look and test drive when it hits dealerships next month? Here’s what you should know about the updated styling, performance, technology, and pricing so you can decide for yourself. Curves are replaced by an angular design to make the RAV4's exterior more aggressive. Toyota’s design team aimed to bring the new 2019 RAV4 back to its roots as a sporty SUV that stands out from the crowded segment of compact crossovers on the roads. Two SUVs that Toyota specifically identified were the Honda CR-V and the Nissan Rogue which are major segment competitors for the RAV4. In order to stand apart from the pack and go from car-like crossover to true sports utility, Toyota’s design team gave the SUV a more aggressive exterior that is more chiseled, less curvy and has a wider stance with a lower center of gravity. The grille on the Adventure grade borrows from Toyota's pickup trucks and screams 'tough'. Toyota took cues from the brand's pickup trucks to create a tougher, more masculine front fascia. The RAV4's Adventure grade stands apart from the others with a unique grille that fits right into an off-road environment. Fans of the Toyota Tacoma and Tundra pickups will enjoy the athletic and rugged look of the new grille - we know we did. The Adventure grade is also distinct from the others thanks to its high-rise roof rails that make this RAV4 ready for any surfing or kayaking rendezvous. In addition to a more aggressive exterior, Toyota is looking to move upmarket with the 2019 RAV4 and made it a priority to create a sophisticated aesthetic. This is evident in both the new exterior as well as the high-quality interior of the top trims. The Limited grades offer a panoramic glass moonroof on both the gas and hybrid models, and while we found the XLE to have a larger amount of plastic, the XSE, Premium, and Limited interiors had more luxurious cabin materials with mostly leather throughout. We can't vouch for the comfort of the front seats on all-day road trips since we swapped vehicles throughout the day and only spent an hour driving in each. For our short drives, however, the front seats felt supportive and comfortable. After a quick stop to refuel at a local coffee and juice shop, we discovered there is plentiful space for to-go beverages and small personal items in the 4 cup holders in the front, and a grand total of 8 throughout the vehicle. While driving the Limited and Adventure grades, we were able to take advantage of the heated seats in the chilly Northern California mornings and the ventilated seats in the afternoons when the thermometer reading rose substantially. This gave us the first taste of the luxury offered by the higher RAV4 grades. Those in the market for a compact SUV to fit their small families or adventurous lifestyle usually have cargo and storage space at the top of their list. Toyota catered to the needs of this target demographic of active singles, couples and those just starting a family by adding an additional 2.5 inches of cargo space and making the cargo area more user-friendly. The updated cargo area includes side pockets behind the wheel wells and two height levels for the cargo area deck which allow drivers to load either long or tall objects with ease. For the many surfers we spotted getting out of the water during our drive, the reversible deck board which offers a plastic surface on one side for wet objects will be a welcomed feature. Toyota has given the RAV4 gas model lineup a new Dynamic Force 2.5-liter inline-four-cylinder engine paired with an 8-speed Direct-Shift Automatic Transmission to improve both power and efficiency. The result is an output of 203 horsepower and a 0-60 of 7.8. We test drove the gas Limited, XLE Hybrid and gas Adventure on road and then we went off the beaten path to try the Adventure and the XSE Hybrid on an off-road course. Here's what we took away. The first model we drove was the gas Limited grade and we found it to have enough power and acceleration for highway driving and passing slower vehicles with ease. Steering and handling were crisp and capable for the sharp curves we took on the winding roads. We put the steering to the ultimate test during our first driver change, when we pulled into a tight turn-around point without any issues. When we returned, we swapped our vehicle for the RAV4 Adventure grade to see how the most rugged vehicle performed on the beaten path. While we could feel more of the bumps in the road, the Adventure grade was excellent for steering and handling. We continued our day by taking the XLE HV out on a quick drive along the twisty, oceanside roads. The 2019 RAV4 hybrid models pair the 2.0-liter Toyota Hybrid System with an Electronically-Controlled Continuously-Variable Transmission (ECVT) for a 219 combined net total system horsepower. Even with the boost in power, the HV models are the most fuel efficient with an impressive 39 combined MPG. Reducing road noise was another priority for the RAV4's design team, so sound dampening materials were used to fill gaps between materials resulting in a quieter cabin. We found the XLE HV's ride to be smooth and quiet, even while accelerating. The XSE Hybrid was surprisingly capable on an off-road course. Perhaps the biggest surprise of the day was discovered on the off-road course Toyota scoped out for us. There were two vehicles dedicated to off-roading including the Adventure grade and the XSE Hybrid. The Adventure grade comes standard with Dynamic Torque Vectoring All-Wheel Drive with Rear Driveline Disconnect which allows proper torque distribution for handling off-road terrain. When AWD isn't necessary such as a long stretch of highway, the Rear Driveline Disconnect system improves fuel efficiency. The Adventure grade also comes standard with Multi-Terrain Select which allowed us to choose between Mud and Sand or Rock and Dirt modes in order to optimize traction. We tested out switching between the two and found we would not have been able to navigate some of the hills if we did not have the Rock and Dirt mode activated. Hill Start Assist Control and Downhill Assist Control made conquering a large hill on the course a no-brainer. While we expected the Adventure to feel right at home off-road, we were shocked to find the XSE HV wasn't far behind in capability. Although there is only one Trail mode for the Hybrid, it still got great traction on the rocky terrain and made it up the large hill without a struggle. The biggest difference in capabilities between the models was going downhill. Without Downhill Assist Control, we had to use the brakes to control the speed at which we descended in the Hybrid which was not the case with the Adventure where we could just focus on steering. When it comes to technology in the new 2019 RAV4, there are plenty of new features worth getting excited about. The RAV4 now comes with Amazon Alexa and Google Assistant as well as Apple CarPlay, and WiFi Connect. Unfortunately for Android users, Android Auto connectivity is not offered in the 2019 RAV4 and Toyota has not given any clues whether or not it will add it in the future. The Entune 3.0 Audio system comes on all models and gives you 6 speakers along with a 7.0-inch touchscreen which we found to be responsive and intuitive. Available upgrades include the Entune 3.0 Premium Audio with dynamic navigation and a larger 8.0-inch screen on Adventure and Limited grades. If you decide to go with the XLE grade, you can upgrade to Entune 3.0 Audio Plus for the 8.0-inch screen and SiriusXM Radio. In addition to connectivity and entertainment, safety was a priority for the RAV4 which is why all models come standard with the Next-Generation Toyota Safety Sense. The features in this system include Pre-Collision System with Pedestrian Detection, Full-Speed Range Dynamic Radar Cruise Control, Lane Departure Alert with Steering Assist, Automatic High Beam, New Lane Tracing Assist, and New Road Sign Assist. For the first time, Toyota is offering a digital rearview mirror standard on its Limited and XSE HV grades. Depending on what you're looking for in your 2019 RAV4, you can select from 9 different grades in gas or hybrid models to ensure you find the right fit. For 2019, Toyota simplified its offerings cutting the grades by 50% without limiting customization. Whether you're prioritizing value, fuel efficiency, ruggedness, or luxury, there is a grade to suit your needs. The 2019 Toyota RAV4 gas models will be offered in LE, XLE, XLE Premium, Adventure and Limited. RAV4 hybrids will be offered in LE HV, XLE HV, XSE HV, and Limited HV. Adventure and XSE HV grades will give you all the off-road capabilities you need while the Limited transforms your RAV4 into a luxury vehicle. For the 2019 RAV4 gas models, the 2019 LE starts at $25,500 MSRP and the price goes up to $34,900 MSRP for the Limited. If you're considering the RAV4 hybrid, the LE HV starts at $27,700 and the MSRP will climb up to $35,700 for the Limited HV. The gas models will be available in December 2018 and the hybrids will hit dealerships starting March 2019.